The Strathmore Children’s Chorus and Maryland Classic Youth Orchestras of Strathmore hop aboard their yellow submarine to revisit the enduring hits of The Beatles, with help from the Rocky Hill Middle School Choirs and local favorite Fab Four tribute band the DeafAids in the Music Center at Strathmore on Wednesday, June 8, 2016 at 7:30 PM. Even 46 years after the band broke up, the treasured music of The Beatles is ubiquitous and loved by generations. This convergence of youth ensembles falls in love with the iconic band as it peruses 20 hummable hits from the prolific Beatles song catalogue, including “Hey Jude,” “Eleanor Rigby,” “Across the Universe,” “Here Comes the Sun,” and more. For more information or to purchase tickets, please call (301) 581-5100 or visit www.strathmore.org. 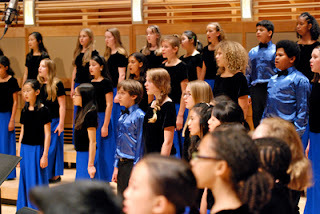 In a departure from their typical classical repertoire, the Strathmore Children's Chorus has been studying the music of The Beatles this season, in a quest to discover why it has stood the test of time to thrill generations of music lovers. The Strathmore Children’s Chorus (SCC) provides a pre-professional choral experience in Montgomery County for students ages 7–18. Under the direction of Founding Conductor and Artistic Director Christopher G. Guerra and Training Chorus Associate Director Mary Hochkeppel, four ensembles (Training Chorus, Treble Chorus, Concert Chorus, and Young Men’s Chorus) promote self-expression in singers, celebrate the diverse musical traditions of our community, and engage talented youth in joy-filled and uplifting music-making. SCC also performs with professional orchestras, other choral groups, and featured artists in ensemble performances, allowing Strathmore to provide a living, breathing, singing presence in our community. Strathmore presents and produces exemplary visual and performing arts programs for diverse audiences; creates dynamic arts education experiences; and nurtures creative ideas and conversations that advance the future of the arts. The organization’s hallmark is the Music Center at Strathmore, with a 1,976-seat concert hall and education complex. Its core campus also includes the historic Mansion at Strathmore, which features an intimate Music Room and art galleries. Most recently, Strathmore opened AMP, a 250-seat cabaret-style venue located just up Rockville Pike from the core campus in the burgeoning Pike District of Montgomery County. Strathmore’s signature education, mission-driven programs include the Strathmore Student Concerts, the Artist in Residence and Strathmore Summer Intensive programs, and its Spring Break @ Strathmore camp.